The holiday's just would not be a hit without toffee! Yum, I love the buttery, chewy, crunch of toffee. This recipe is so easy to make, fool proof and fun. A great one to get the kids involved. 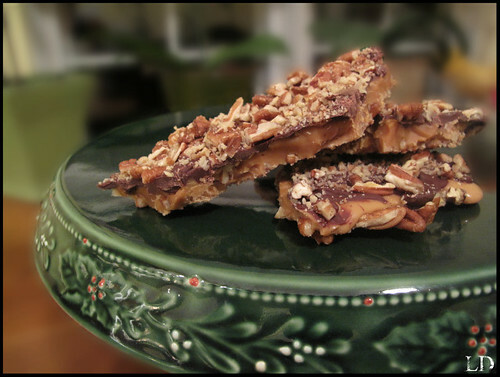 A little different this toffee is made with pecans instead of traditional walnuts. Roughly chop your pecans, place on cookie sheet and toast in oven until fragrant. 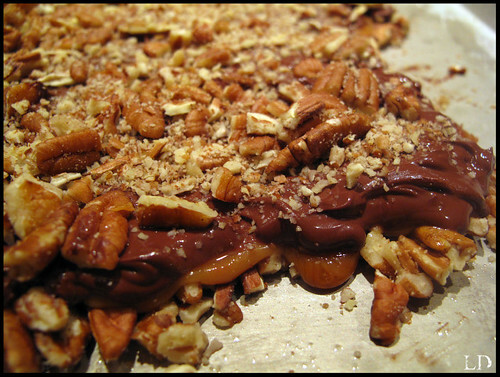 Spread one cup of roasted pecans onto a buttered cookie sheet. Bring sugar and the next three ingredients to a boil in a heavy saucepan over medium heat, stirring constantly. 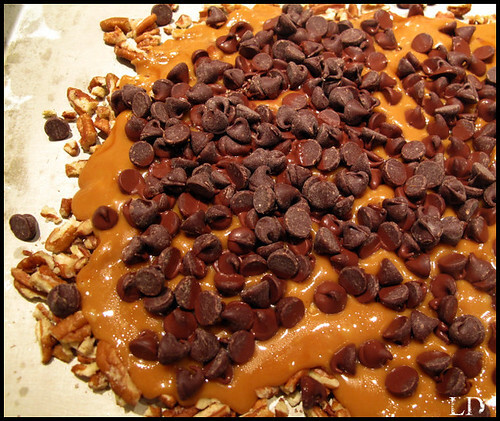 Cook until mixture is a golden brown peanut butter color and the candy thermometer registers 290˙ to 310.˙ Pour sugar mixture over roasted pecans on cookie sheet. Sprinkle with chocolate chip, and let sit for 30 seconds, so the chips can melt. Spread the melted chocolate evenly over the top. Sprinkle with the remaining 1/2 cup of chopped pecans. Chill for 1 hour. Break into bite size pieces. This is the best Christmas treat to give as gifts. Man you've been making me drool all week! Lol... Yummy stuff!